Stocks snapped their losing streak and regained steam last week despite some soft data, posting weekly and monthly gains. For the week, the S&P 500 gained 1.16%, the Dow rose 0.69%, and the NASDAQ grew 0.78%. July was a volatile month, with a tug-of-war between overseas and domestic data and concerns about a Greek exit from the Eurozone. Despite all the downward pressure, stocks managed to record a respectable gain for the week. Earnings season continued, and we have results from over 350 S&P 500 companies. So far, overall earnings were down 2.5% year-over-year on 4.4% lower revenues. 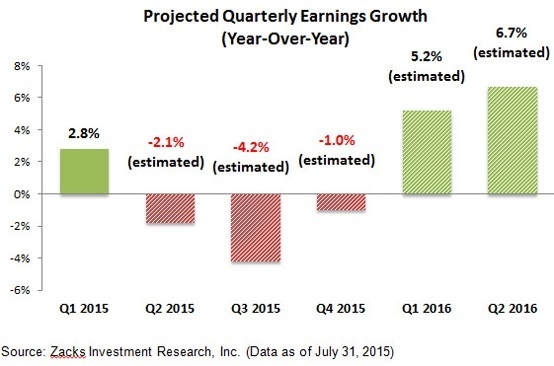 The Energy sector is dragging on overall earnings growth because of low oil prices. Taking Energy companies out, analysts expect overall S&P 500 earnings to be up 5.4% year-over-year on 1.4% higher revenues. Now that the overall earnings picture is firming up, analysts are turning their attention to third-quarter expectations. Unfortunately, it looks like U.S. companies are even more cautious about the rest of the year and earnings estimates for Q3 and Q4 are coming down across the board. The chart below shows that overall earnings growth is expected to be negative in the third and fourth quarters before picking up early next year. Will these estimates hold? It's hard to say. Many corporate managers prefer to "under-promise and over-deliver" on estimates, artificially lowering them so as to be able to beat their own expectations. We'll know more as the quarter progresses. The Federal Reserve met again in July, and though no interest rate changes were announced, the central bank reiterated its intentions to raise rates this year - possibly as soon as September. Are higher rates already baked into stock and bond prices? We don't know for certain, but the Fed has been telegraphing its rates play for months now, so we hope that markets won't overreact when rates finally start to go up. 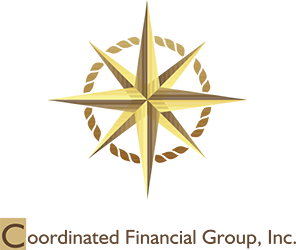 Though we don't know how quickly the Fed will start hiking up rates, we expect the process to be slow and gradual, giving the economy time to adapt. We also got our first look at second quarter Gross Domestic Product, which showed that the economy grew at 2.3% in the second quarter. While economists had predicted higher growth, it's still a vast improvement on the 0.6% growth the economy saw in the wintery first quarter. The week ahead is packed with economic data, including motor vehicle sales, factory orders, and the July employment situation report. Analysts will be highlighting Friday's July jobs report to see whether it supports or detracts from the Fed's case for raising rates. If hiring remains strong and wage growth improves, the Fed may still be on target for a September rate hike. If wage growth is soft, it could push the timeline out. Consumer sentiment drops in July. Two measures of how American consumers feel about their economic prospects dropped in July, partly because of concerns about economic growth as well as worries about Greece and China. Big cities drive rental prices high. U.S. home rental prices rose much faster than incomes in June. Unsurprisingly, major cities like San Jose, San Francisco, and Denver experienced double-digit year-over-year increases as demand pushed rental prices higher. Weekly jobless claims rise slightly. Though weekly claims for new unemployment benefits edged higher last week, the four-week average dipped lower, indicating that the labor market continues to improve. Oil prices drop as producers keep pumping. Crude oil experienced its biggest monthly drop since 2008 on signs that Middle East producers were continuing to pump at record levels despite concerns about a supply glut.